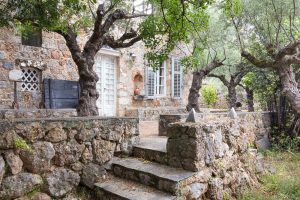 In the past year two things have happened to add some details to the story of Joan Leigh Fermor, photographer, described in my blog of 22nd November 2017. First, the publication of Patrick Leigh Fermor – The Journey Continues. 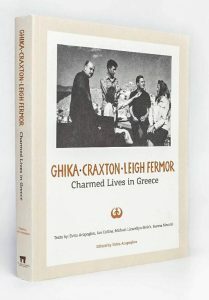 Second the exhibition and associated publication ‘Ghika Craxton Leigh Fermor – Charmed Lives in Greece’. 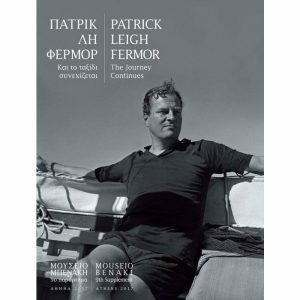 Patrick Leigh Fermor – The Journey Continues (9th Supplement, Benaki Museum, Athens, 2017) presents a series of essays on the life and legacy of Patrick Leigh Fermor (Paddy, PLF). Joan is mentioned, insofar as she is part of that life and legacy, in two contributions: ‘Paddy and Joan’ by Cressida Connolly; and ‘Curating the Sir Patrick Leigh Fermor Archive’ by David McClay. Six photographs are credited to her, four of them being of Paddy and their house at Kardamyli. Connolly describes Joan as quiet, shy even, measured, clear sighted, interested in unconventional people and with an excellent mind and sound judgement. ‘She was an observer, but she was always very present’, says Connolly. A line can be drawn between these qualities and Joan’s career as a photographer: ‘Naturally watchful, she began to take photographs’, suggests Connolly. Joan ‘delighted in ghoulish things’, which brings to mind immediately her photography of Pere Lachaise Cemetery, London’s Victorian cemeteries and cemeteries in Genoa, Guadeloupe and Haiti. This exhibition opened at the A. G. Leventis Gallery in Nicosia, Cyprus, in February 2017, moved on to the Benaki Museum, Athens, in June 2017, before a run at the British Museum, London, from 8th March to 15th July 2018. 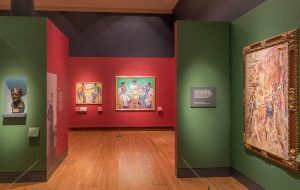 The exhibition included paintings, drawings, photographs, text, a short film and artefacts. 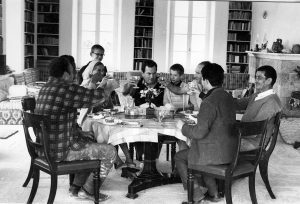 It records what Sir Michael Llewellyn-Smith in the film calls, ‘a time of renaissance of literary and artistic collaboration between Britain and Greece’. The substantial, well-illustrated publication to accompany the show, edited by Evita Arapoglou, documents the lives in Greece of the creative trio. My comments below are based on the 3rd revised edition, April 2018. The exhibition included eight photographs credited to Joan. The book has 16 photographs credited to her, six related to building their house at Kardamyli, five portraits of Paddy, two of Ghika and one of John Craxton, and two group pictures. 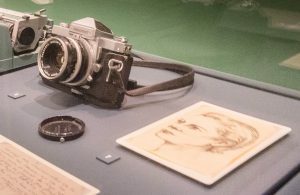 Joan’s Nikkormat, which she used to document the building of the house, was an exhibit. Both The Journey Continues and ‘Charmed Lives in Greece’ focus very deliberately on Patrick Leigh Fermor, not Joan, who is a supporting actor in the ‘renaissance’ drama that is recounted. She emerges as reserved intelligent, thoughtful and organised, qualities that complemented Paddy’s very different character. This was certainly not a purely passive role: she accompanied Paddy in his explorations of Greece; and her photographs informed his writing and graced his publications. In the film show at ‘Charmed Lives’, John Craxton speaks of how he and Ghika were ‘working by memory and imagination’. That would be a very good description of Paddy’s writing too and Joan’s photographs were important to him on both counts. Connolly writes of Joan as ‘naturally watchful’ and an ‘observer’, both qualities essential for good photography. They have shaped the significant, interest and importance that McClay accords her work. But the limited number and range of photographs included in the exhibition and publications offer few new clues as to the quality of her work, other than as competent records. A sense of personal and photographic competency emerges and it appears this how she was seen in the wider literary and artistic circle of which she was a part, not as creative artist in her own right. How much this is really due to any limitations she had as a photographer or the cultural climate that still relegated photography to the lower ranks of the arts is an open question. This entry was posted in The Mani. Bookmark the permalink.